IF YOU'VE GOT A TASTE FOR TERROR... TAKE CARRIE TO THE PARTY. CARRIE is the story of a shy wallflower who gets a chance to blossom when the best looking boy in her class asks her to the senior prom. There are problems to be faced, however, foremost among them a domineering mother who refuses to let her attend because she's a religious fanatic who thinks dances are sinful. This is mild, however, when compared to the cruel joke prepared for her by several of her classmates if and when she does appear at the prom. what they don't know is that Carrie possesses a strange power (the ability to move objects by using thought waves) that she uses against people if they aggravate her! This power is totally unleashed at the Bates High School gymnasium at the moment when the King and Queen of the prom are being announced. This stylish homage to Alfred Hitchcock garnered Academy Award nominations for Sissy Spacek and Piper Laurie, and featured John Travolta in his first important screen role. 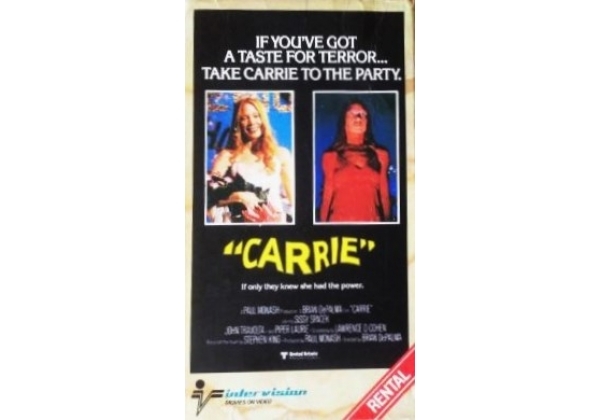 Or find "Carrie" on VHS and DVD / BluRay at Amazon.